Here's all you should know about the different types of yogurt and understand which ones are actually healthy. I grew up eating Dannon strawberry yogurt while my brother began hoarding the lemon flavor long before he could utter the words lemon or yogurt. My kids love yogurt, too, yet eating the creamy stuff is more confusing than it was in the 1970s and '80s. Now there is drinkable yogurt, squeezable yogurt, Greek yogurt, and yogurt made from coconuts, soy, almonds, cashews, hemp and flax seeds. Kefir and lassi are yogurt's close relatives and don't forget the frozen kind (a favorite during my college years). So which ones are actually yogurt, and which ones are actually healthy? 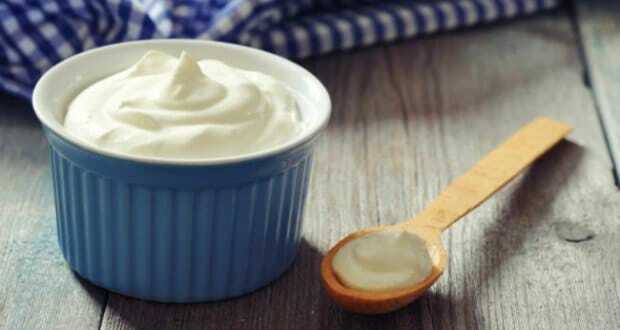 According to Merriam-Webster, yogurt is made by adding bacteria to milk to help ferment some of its carbohydrates. 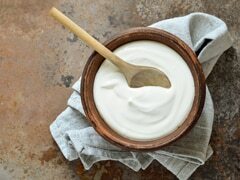 Alternative products such as almond and coconut milk yogurts may not be made from real milk, but because they taste like yogurt, smell like yogurt, are eaten like yogurt, are sold in the same grocery aisle as yogurt and are made from a form of milk, let's call them by the same name. When evaluating yogurt for nutrition, start by peeking at the sugar content on the nutrition facts panel. Traditional yogurt has natural sugars from lactose and from any real fruit, both of which are of little concern, but you do want to avoid added sugars such as cane sugar or fake sugars such as aspartame or sucralose. Most "fruit-flavored" yogurts do not include much fruit but have added sweeteners and flavors. Ideally, your choice would deliver less than 15 grams of sugar per serving, and more grams of protein than sugar. After you investigate the sugar content, search the label for food colorings or other unnatural additives and avoid the brands with too many of these. Countless drinkable and squeezable yogurts have lots of additives and large amounts of sugar. Carrageenan is one of the most common additives in alternative milks and yogurts, and is suspected to be an allergen and digestive irritant. It is extracted from red seaweed and used as an emulsifier to stabilize the ingredients. Cow's milk: Cow's milk yogurt provides the ample protein (6 to 8 grams per small container), calcium and B vitamins yogurt is famous for. Cow's milk yogurt contains less lactose than straight cow's milk because much of the lactose is used up during fermentation, which means that people who are lactose-intolerant may be able to digest yogurt better than milk. 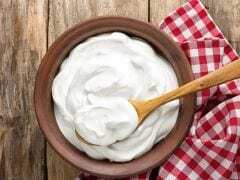 Greek yogurt is usually thicker and higher in protein (14 to 16 grams per small container) because it is strained to remove the liquid whey, but it is often lower in calcium and other minerals as many of theses nutrients get left behind during straining. Most cow's milk yogurt contains good bacteria known to be beneficial to the gut, yet when yogurt is heated too high and processed, for instance when it is added to cereal bars, ground into a powder or used to cover raisins, it loses that beneficial bacteria. Goat's milk: Many people who have a hard time digesting cow's milk do better with goat's milk. This variety offers similar protein, calcium and fat counts as cow's milk but can cost more. Almond milk: Almond milk yogurts are often low in sugar and deliver healthy fats, but they are also lower in protein (4 to 6 grams) than cow's milk yogurts and have almost no calcium unless fortified. Avoid brands with a long list of additives or thickeners, and remember that nuts can be an allergen. Hemp milk: Hemp milk yogurt provides heart-healthy omega-3 fats, about 8 grams of protein and many of the essential amino acids. It lacks calcium, is pricey and is harder to find in stores, but makes for a healthy snack. Flax milk: Flax milk yogurts provide heart-healthy omega-3 fats, about 6 grams of protein (partially derived from pea protein), some calcium (about 20 percent of the recommended daily allowance) and good bacteria. They are pricey and have a longer ingredient list than many other alternatives. Cashew milk: Yogurt made from cashew milk is lower in sugar with generally 1 gram per serving, is a source of good bacteria, and is made with fewer ingredients and additives than other alternative varieties. Yet it provides less protein than many alternatives, generally delivering about 3 grams per serving and almost no calcium. Coconut milk: Yogurts made from coconut milk are low in sugar and full of antioxidants, and provide easily metabolized fatty acids; yet they are also low in protein (generally about 1 to 3 grams per serving). The So Delicious brand includes additives and thickeners, though many smaller producers such as CoYo have a shorter ingredient list. Soy milk: Soy yogurts have protein counts comparable to cow's milk yogurts and deliver healthful, unsaturated fats. Studies show that soy products can lower cholesterol and decrease blood sugar levels, especially in diabetes sufferers. Unsweetened soy yogurt may have no sugar, yet also very little calcium. Watch for too many thickeners and additives. Pea protein: Daiya's yogurts, which are made from pea and potato proteins plus coconut, are high in protein, with 6 grams per serving, and low in sugar. These products are fortified with calcium, vitamin B and vitamin D, and include a fair amount of other ingredients. If these yogurts all sound like good options, it is because they are. Although they all share the yogurt moniker, each offers different health benefits, and some include additives you may want to avoid. My mother served us Dannon yogurt for the protein and calcium, and decades later, those nutrients remain most prevalent in traditional yogurt. Nearly all of the yogurts made from alternative milks provide less naturally occurring protein and less calcium (in some cases almost none), yet on the flip side fewer saturated fats, more healthful fats and less sugar. So listen to your body, and whichever one of these yogurts tastes best to you and leaves you feeling good is your winner.